In a work rich in maritime lore and brimming with original historical detail, Eric Jay Dolin, the best-selling author of Leviathan, presents the most comprehensive history of American lighthouses ever written, telling the story of America through the prism of its beloved coastal sentinels. 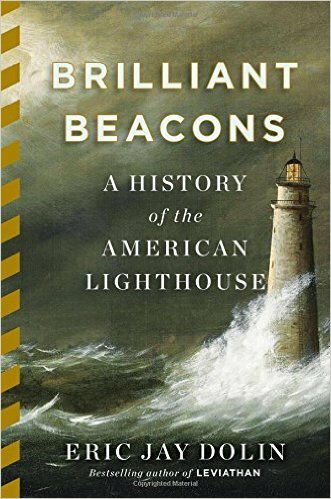 Set against the backdrop of an expanding nation, Brilliant Beacons traces the evolution of America’s lighthouse system, highlighting the political, military, and technological battles fought to illuminate the nation’s hardscrabble coastlines. In rollicking detail, Dolin treats readers to a memorable cast of characters including the penny-pinching Treasury official Stephen Pleasonton, who hamstrung the country’s efforts to adopt the revolutionary “Fresnel Lens,” and presents tales both humorous and harrowing of soldiers, saboteurs, ruthless egg collectors, and most importantly, the light-keepers themselves. Richly supplemented with over 160 photographs and illustrations throughout, Brilliant Beacons is the most original history of American lighthouses in many decades.